Johannes Stork, employee building management and new employee Aaron Arefe Mesegna from Eritrea work in the garden at DATRON AG. DATRON, the South Hessian company specializing in machine construction, regularly supports refugees from the region. Both companies and new residents benefit from such dedicated employees as Johannes Stork, and not only from the intercultural exchange. “Aaron has become very dear to my heart,” says Johannes Stork, employee for Facility Management at DATRON AG. Since December 2015, Aaron Arefe Mesegna from Eritrea supports the Facility Management and Catering teams at DATRON’s corporate headquarters in Mühltal-Traisa. “I know Aaron as an attentive, hardworking young man with many ideas he implements reliably in a short time,” says Stork. The 20-year-old Aaron accompanies him on the extensive premises with seven commercial buildings and thereby comes in contact with employees from the most diverse departments. This allows Aaron Arefe Mesegna not only to gain experience, but also to learn the German language very quickly. 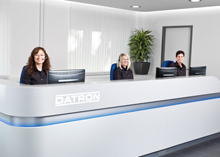 Even an already international company like DATRON benefits greatly from this intercultural exchange. “We consider it to be our social responsibility to do our part for local integration. The awarding of jobs creates future perspectives, not only for refugees but also for DATRON, the economy and the region,” explains CEO Dr. Arne Brüsch. Jointly with the “Netzwerk Asyl” (Network for Asylum) in Mühltal, DATRON has already implemented several projects and more are planned. On behalf of Aaron Arefe Mesegna, however, a committed citizen appealed to DATRON’s CEO and the contact was made directly. “I live in Mühltal Traisa and know the terrain. And I had thought for a long time: I would really like to work in this company,” is how Aaron Arefe Mesegna describes his entry into the machine construction company from Mühltal. Johannes Stork has great fun introducing him into the DATRON world. No wonder: he also works privately with three refugees with whom, for example, he is planting trees in the Traisa forest. “Thus they see how something you created yourself grows and prospers,” says Stork.